Twelve graduates received Master of Divinity degrees, while 13 received Master of Arts degrees and six were awarded Master of Theology degrees. Eight women were included among the graduates. “Seminary means ‘a place where the seed is sown,’” he reminded the graduates, “but for a seed to bear fruit, the soil has to be turned over, raked, sifted, watered, and weeded. You’ve been working really hard, but in the midst of doing that, you’ve been worked over, stretched, pushed, and extended in ways that seemed to you to be incomprehensible. “Yet all of that has made you more merciful, resilient, and loving, so that the seed that’s been planted here can bear fruit,” he explained. The highlight of the ceremony was the Commencement Address by His Eminence, Metropolitan Elia of Oulu, Finland, a Saint Vladimir’s alumnus (M.Div., ’03). He recalled his own days as a student and then addressed the graduates, saying, “You have spent time learning about the great gift that has been given to you: no less than Christ crucified, risen, and manifest in His Church. Over a decade ago, His Eminence had missed his own Commencement ceremony due to the death of his mother, whose funeral had coincided with the day of his graduation. In a touching presentation, Alumni Association Board Chair Gregory Abdalah gave Metropolitan Elia the customary gift for Saint Vladimir’s Seminary graduates: a cherry wooden frame for his diploma. Other honored guests at the Commencement were the Very Reverend Dr. Mardiros Chevian, Dean of Saint Nersess Armenian Seminary, and His Eminence, Archbishop Melchisedek of Pittsburgh and Western Pennsylvania. A photo gallery by Leanne Parrott Photography and audio recordings of the Commencement addresses may be accessed here. 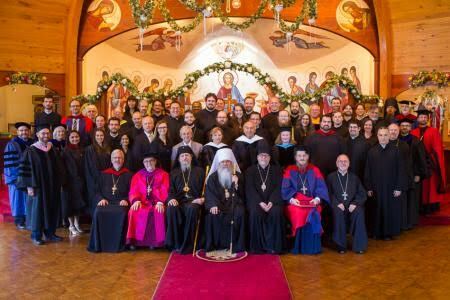 Commencement exercises also were held in late May at Saint Tikhon’s Seminary, South Canaan, PA and Saint Herman’s Seminary, Kodiak, AK. Information and photos will be posted on the OCA web site as they are received.